Choosing a plan is one of the biggest decisions you’ll make when you’re preparing to retire. Here is a description of each of the six TRA plans. A MARRIED MEMBER must choose a survivorship plan unless your spouse signs a waiver forfeiting the right to a benefit. A waiver is also needed if you select a plan for someone other than your spouse. Benefits are paid monthly for your lifetime. The amount is based on the member’s age and each designated survivor’s age. If you die before your designated survivor, he or she will receive monthly benefits for life equal to 100 percent, 75 percent or 50 percent of your monthly payment, depending on the plan. You may designate more than one survivor. If you choose a non-spouse survivor, age restrictions might apply when selecting the 75 percent or 100 percent options. These three plans allow your monthly payment to increase if your designated survivor predeceases you. If you designate more than one person, once each dies, the deceased individual’s payment stops. The benefit will not be divided among remaining designees. An UNMARRIED MEMBER may choose any plan. The benefit amount is based on the member’s age and each designated survivor’s age. This plan offers monthly benefit payments for your lifetime. Payments in this option are the highest available because there is no survivor coverage. Payments stop upon your death. If you die before the expiration of two months following your first payment, your designated beneficiary is paid a lump sum amount equal to your contributions and interest, less any monthly benefit payments you received. If you die after the expiration of two months following your initial payment, your designated beneficiary is paid any uncashed annuity payment due for the month that death occurs. If you had already cashed or deposited the annuity payment for the month in which death occurs, nothing more is payable. If your beneficiary dies before you and you did not designate a contingent beneficiary, the funds go to your estate. This plan offers monthly benefit payments for your lifetime. Payments may cease upon your death depending upon whether you have recovered the contributions and interest you made to TRA during your working years by the date of death. If you die before receiving benefit payments in an amount equal to your accumulated contributions and interest, the same monthly amount is paid to your beneficiary until that amount is depleted. If you die after your accumulated contributions and interest are depleted, your beneficiary is paid any uncashed annuity payment for the month that death occurs. If you had already cashed the payment, nothing more is payable. If your beneficiary dies before you and you did not designate a contingent beneficiary, the amount is paid to your estate. Benefits are payable monthly for your lifetime. If you die before receiving payments for 15 years, your designated beneficiary is paid the same monthly amount for the remaining years. 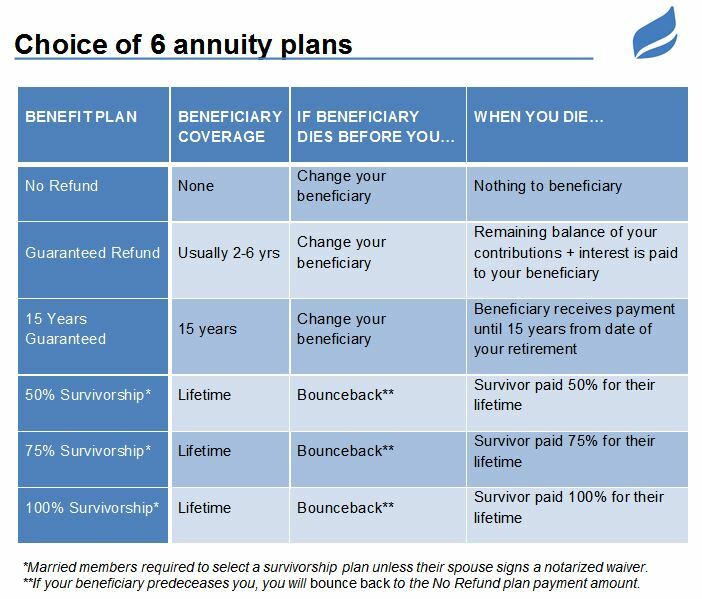 If you die after receiving payments for 15 years or more, your beneficiary is paid any uncashed annuity payment for the month that death occurs. If your beneficiary dies before you and you did not designate a contingent beneficiary, the amount is payable to your estate. At retirement, you may elect to receive a greater or “accelerated” monthly annuity payment. An accelerated benefit means your monthly benefit amount is higher until age 62, 65, or your normal Social Security retirement age, then drops for the duration of the lifetime annuity amount.